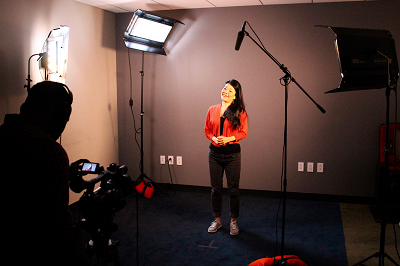 The NY On-Camera Lab, located at the Foundation offices at 1900 Broadway, 5th Floor, New York, is a space for union performers to record high quality auditions as well as gain valuable experience in front of a camera. The NY On-Camera Lab is a free facility for SAG-AFTRA members and made possible through gifts, grants and sponsorships. The Foundation never draws on SAG-AFTRA dues or initiation fees. Give your support to the NY On-Camera Lab. How do I sign up for an audition slot? Fill out the NY On-Camera Lab application HERE. Once your application has been approved, make an appointment via the NY On-Camera Lab Calendar HERE. Make sure to bring an 8GB/16GB USB flash drive and two copies of your sides. The USB flash drive should have at least three (3) GB of free space. You’re also welcome to bring a reader. Otherwise, the lab technician will be happy to assist you. You can read more about the NY On-Camera Lab and its guidelines HERE.